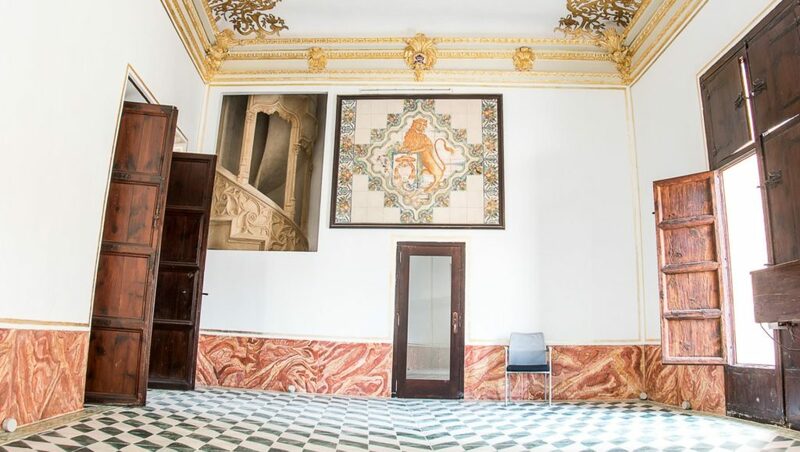 The College of High Silk Art has its origins in the fifteenth century due to the need to unify criteria for the production of silk in Valencia, given the conflicts that originated by the lack of quality of some producers. Thus, on the 16th February 1479, the Velluters Guild, made up of velvet weavers, adopted the first bylaws of the guild. Some bylaws were officially ratified by King Ferdinand the Catholic on the 13th October 1479. 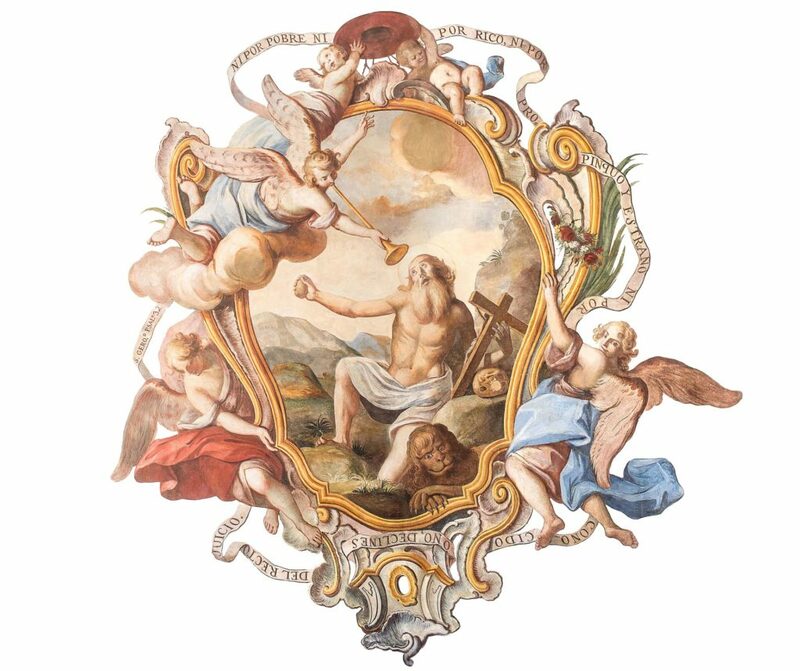 The Guild was elevated to the College of High Silk Art by the title that King Charles II gave them in 1686. The headquarters of the Guild settled in the neighborhood that gave name to Velluters (velvet weavers) due to the high concentration of looms that occurred in this neighborhood, which once in 1767 had about five thousand looms that gave jobs for nearly half the population of Valencia. The plot of the current building was acquired in 1494 but the building (which was declared a national historic monument in 1981) had several architectural transformations throughout its history, which shows a mainly Baroque style. It is the main room of the College and the place where the top leaders of the institution met. This room is a microcosm composed of the heavenly part with a ceiling fresco of St. Jerome, patron of the Guild, by José Vergara. 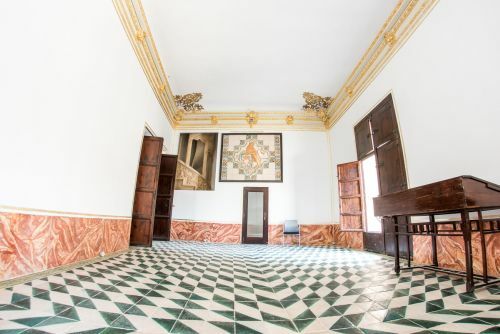 Also, the earthly part of the soil, with an authentic jewel of Valencian ceramics composed of a pavement, which represents the four continents known at that time (both works made in 1757). 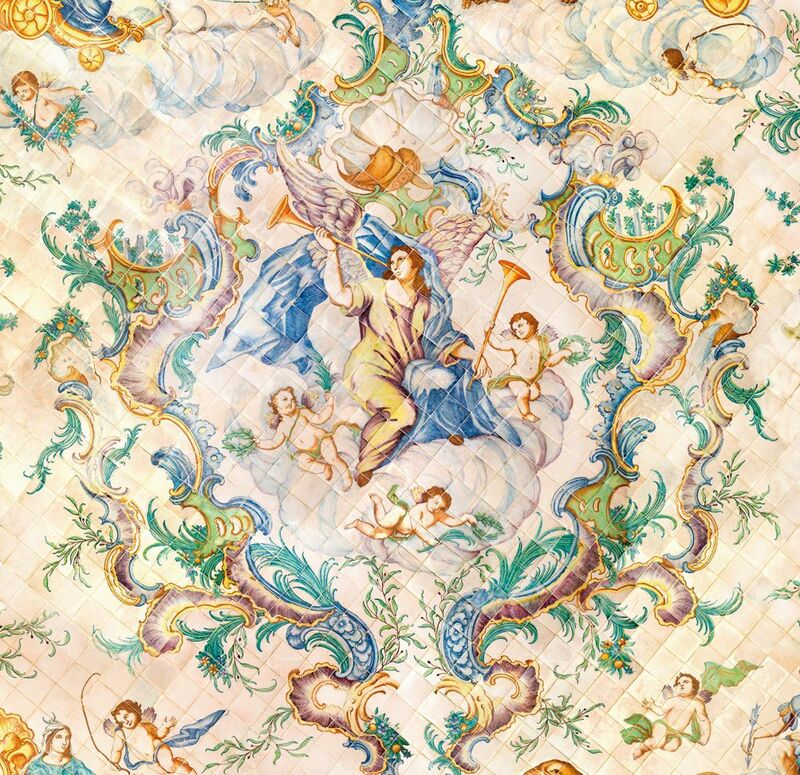 This stunning floor intends to highlight fame (represented by a woman) achieved by the Valencian silk worldwide. The author of the pavement, Vicente Navarro, was inspired by Bernini’s fountain in the Piazza Navona in Rome, where the continents are represented through their major rivers (Danube, Nile, Ganges and Rio de la Plata). Navarro represented the continents by a woman in a carriage, where each continent is pulled by animals from the region, as are horses in Europe, elephants in Asia, lions in Africa and one species of lizards or alligators in America. Given the deterioration that this pavement had experienced, it has been necessary to remove all its pieces, restore and reinstall them. In order to do this we used the latest technology available in this field. In this space the pavement is decorated with white and green tile diagonally placed creating a spectacular optical effect. It is connected with a Gothic spiral staircase, which remained hidden for centuries behind a wall, and which has certain similarities with those made by Pere Compte in buildings such as the Lonja. Composed of innumerable documents that have been saved over five centuries and keep the history of the guild and its bylaws; minute books; books of masters, journeymen and apprentices, and books of administration and inspection of factories and shops… We must not forget that the College, in its work of inspection, could seize and burn fabrics that did not meet the bylaws. 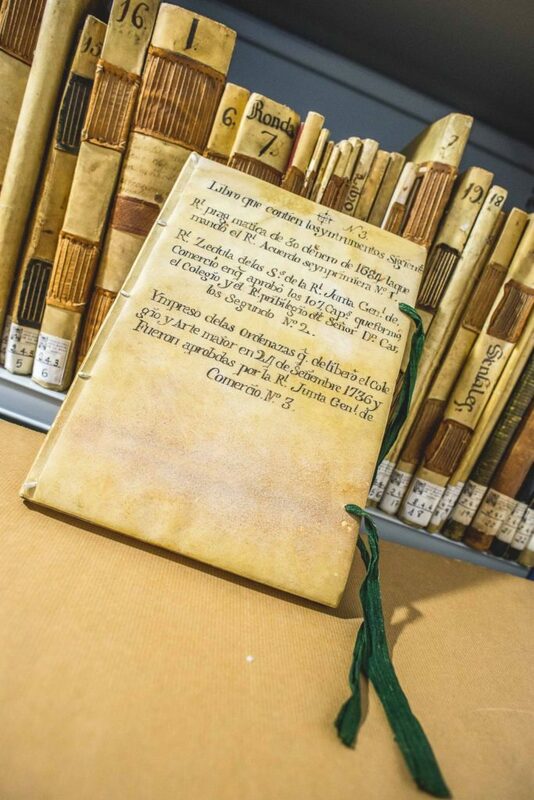 The archive of the College of High Silk Art in Valencia is one of the essential keys to study the evolution of the Valencian economy, at least from the fifteenth century to the late twentieth. Its status as a corporate institution and delimited in the territory has provided a lot of information to all researchers from various disciplines, but especially those who study the proto-industrial processes, trade associations and sericulture productions of the Valencian territory. But, above all, to understand the business and social processes in the Valencian city of the fifteenth century and all relations with the routes and trade agreements of the time. The guild’s archive at the College of High Silk Art is the most important archive in Europe. It consists of 48 scrolls, 660 books and 97 file boxes with different bundles from the start of the college. Almost all the documents refer to velvet weaver’s guild, although some documentation from other guilds is also preserved. In the library we find authors and works such as the ones by the Marques de Cruïlles, which makes special reference to the guild and the work of 1871; the lessons of Professor Eduardo Pérez Pujol, who explained from his professorship in 1886, the past of the Valencian guilds as a solution to the problems between capital and workers through voluntary union of all the factors of the industry; the work of the historian Almela i Vives, who believed that lovers of the city will never be grateful enough to those who knew how to preserve the building of the College of High Silk Art during adverse times because it represents one of the brightest and most valuable art of Valencian genius. 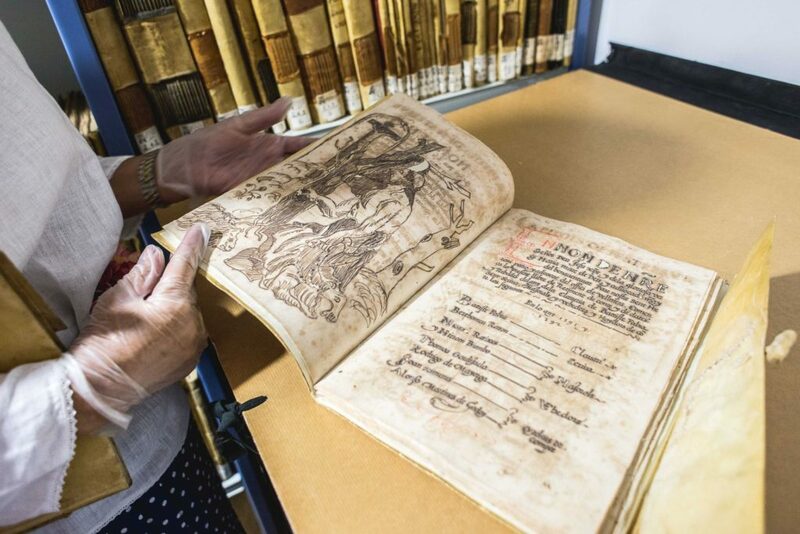 The Valencian economic history cannot be understood without the documentary contributions of this archive. In this case, documentation is important not only for the value of information that may be found in it, but for the continuity of it. Phone: 697 155 299 / 96 351 19 51.